David Cameron has travelled more than 1,000 miles further than Lib Dem leader Nick Clegg in the early stages of the general election campaign, BBC analysis has shown. 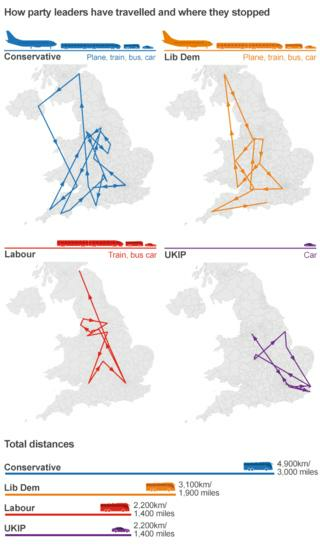 Since the dissolution of Parliament, the Conservative leader's itinerary has also taken him more than twice as many miles as those of Labour leader Ed Miliband and UKIP's Nigel Farage. The PM's decision to visit all four nations in the UK on Tuesday meant that the Conservatives had to hire four separate buses to manoeuvre his entourage between campaign venues. But while Mr Cameron has visited a high proportion of seats attempting to defend slim Conservative majorities, Mr Miliband appears to have adopted a more aggressive strategy. His travels have taken him to nine constituencies that returned Conservatives in 2010. Six of these seats ejected a Labour previous incumbent in 2010, including Lancaster and Fleetwood, and Morecambe and Lunesdale, both of which the Conservatives won with a majority of fewer than 1,000 votes. The Labour leader has not yet campaigned in any constituencies that voted Lib Dem in 2010. Mr Clegg's campaign stops betray the most defensive approach of the three men. Eleven of the 14 seats he has visited voted Lib Dem in 2010, and seven of those 11 did so by a majority of fewer than 5,000 votes. He has visited just one seat that the Lib Dems lost in 2010: Montgomeryshire. UKIP's Nigel Farage has focused his campaigning on Kent, perceived by pundits to be relatively receptive to the Eurosceptic party, undertaking several visits to the South Thanet seat where he hopes to overturn the 7,600 majority won by the Conservatives at the last election. But the party's high hopes for electoral breakthrough in the north-east of England are illustrated by its decision to hold a high-profile event in Grimsby. In total, Mr Farage has covered almost as many miles as Mr Miliband. Despite leading just two MPs at the time of dissolution compared with Labour's 256. The routes of all four leaders converge in Salford, where the recent TV debate was recorded. But other crossover points hint at fierce battles to follow. Both Mr Cameron and Mr Clegg have visited Chippenham, where the Lib Dems held on in 2010 by 2,470 votes, and North Cornwall where their majority was 2,981. Meanwhile Mr Miliband and Mr Cameron competed for the attentions of Kingswood voters, where the Conservatives defeated Labour in 2010 by 2,445 votes. The BBC has attempted to account for every campaigning event involving David Cameron, Ed Miliband, Nick Clegg and Nigel Farage since the dissolution of Parliament on 30 March up until Friday 10 April. Distances between these events were calculated using Google Maps, so the "total distance" displayed in the graphic at the top of the page represents the minimum distance that would be required to attend each event by car (or car and ferry in the case of the Conservatives' Northern Ireland trip). It does not equate to the actual distance travelled by each party leader since the start of the campaign, because their movements before and after each day of campaigning are not known. Neither does it account for the fact that some journeys taken by the leaders and their entourages were by plane or train. Constituency names relating to each visit were obtained with the help of MySociety's MapIt API.